Interpretation at Montpelier, James Madison’s Virginia plantation, owned since 1984 by the National Trust, has incorporated stories of the enslaved community since at least 1997. In 2000 the Montpelier Foundation was created and co-stewardship with the National Trust for Historic Preservation began. Between 2003 and 2008, the foundation undertook a massive restoration—removing extensive additions that the William duPont family had made to the Montpelier house in the 20th century. With two duPont-era rooms and an exhibition about the duPont family installed in a new visitor center, and by agreement with the family, the foundation decided that the period of interpretation would be that of James Madison’s retirement years, 1817–36. Since 2000, staff members have conducted documentary and genealogical research to understand the Montpelier plantation and its enslaved community. To date we have identified nearly 300 enslaved people by name and located the living descendants of five. As a result of archaeological investigation, we have an overall understanding of the physical plantation landscape, including the relative locations of farm operations, plantation industries, and dwellings of enslaved domestic and agricultural workers, as well as the material worlds of those living under slavery. Engaging with our descendant community has been a hallmark of Montpelier’s work interpreting slavery. We first connected with the African American community in 1999, when local resident Rebecca Gilmore Coleman approached us about commemorating Montpelier’s slave cemetery. Organize the commemoration led Coleman and local activist Carolyn French to found the Orange County African American Historical Society, which has partnered with Montpelier ever since. 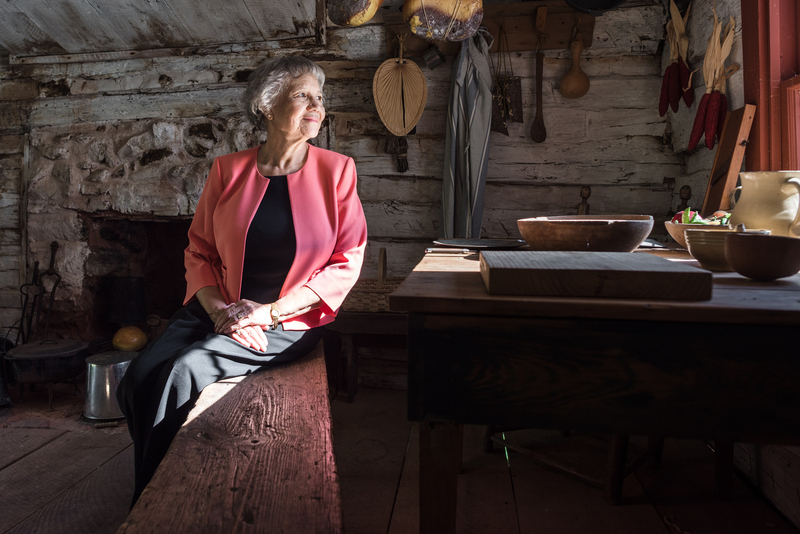 Rebecca Gilmore Coleman in her family's cabin, a permanent installation of James Madison's Montpelier. Coleman, along with Montpelier, also led the effort to restore the Gilmore Farm across the road from Montpelier. Coleman’s great-grandfather purchased the farm after emancipation, and the original house still stands on what is now Montpelier property. With advice and input from a committee of African American scholars, descendants, and local residents, we undertook the restoration and interpretation of the Gilmore Farm between 2001 and 2005. We now interpret the home of a recently emancipated family in its original location, possibly the only such site in the United States. Work on the Gilmore Farm project and related research, as well as participation in archaeological excavations at the sites of enslaved people’s dwellings, has created a large group of stakeholders in African American history at Montpelier. We define this community broadly, including in it those whose biological ancestors were enslaved by the Madison family at Montpelier; those whose biological ancestors were enslaved elsewhere in Orange County, Virginia; and those with no biological ties who nevertheless feel connected to Montpelier as a result of our efforts to study and interpret the lives of the enslaved. Members of the descendant community have returned for periodic reunions and events—and, importantly, as consultants on Montpelier’s efforts to expanded our interpretation. A transformational $10 million gift from David Rubenstein in 2014 enabled us to put our research into practice by using archaeology to inform the reconstruction of six slave dwellings and work buildings adjacent to the main house. Christian Cotz, director of education and visitor engagement, led the planning of “The Mere Distinction of Colour,” an exhibition to occupy the cellar level of the house and extend into the six newly reconstructed buildings. Proun Design and Northern Light Productions of Boston were chosen to design the exhibition and create the relevant media. In fall 2015, as preparations for the exhibition got underway, Montpelier staff met with an advisory group composed of members of the descendant community along with scholars and museum colleagues who work in African American history, including Brent Leggs, senior field officer at the National Trust. After hearing preliminary exhibition plans, the group had two main requests. We hope that, by inviting their input, we have created an exhibition that breaks new ground in acknowledging the contemporary relevance of slavery and in striking a balance between history and emotional impact. The first request of the advisory group highlighted an important tension inherent in the interpretation of slavery. While white visitors to historic sites may view slavery as a historical issue located in the past, black visitors frequently view slavery as a personal issue—a trauma that their ancestors overcame, but one that is still raw, still provokes anger and shame, and still has relevance and consequences in the present. The advisory group asked us not to leave the story of enslavement at Montpelier in the past, but to bring it up to the present day. To address this request and in order to avoid the common museum pitfall of ignoring the story of race in America between emancipation and the civil rights era—and again between then and the present day—we created a 10-minute film that considers the legacies of slavery in contemporary American society. Furthermore, members of the descendant community became collaborators in the exhibition. 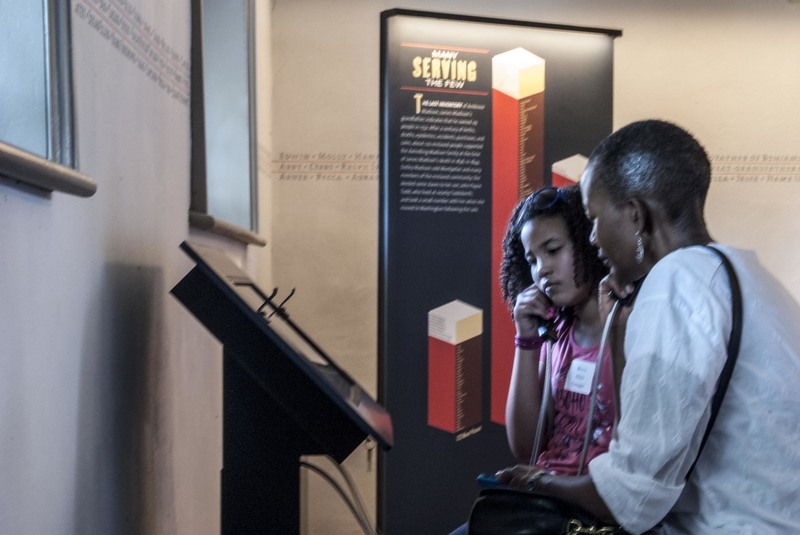 At several points in the cellars and the reconstructed buildings, visitors hear and see descendants discussing, in their own voices, the institution of slavery, the way it was practiced at Montpelier, the stories of their ancestors, and what those ancestors mean to them. The advisory group’s second request was that we emphasize the humanity of enslaved people. In some attempts to put slavery in historical context and to show how enmeshed the creation of the American nation was with the institution, museum curators and educators lose sight of the fact that they are talking about human beings. We have attempted to appeal to a universal humanity by presenting one of the many horrors of slavery: the possibility that one’s parent, child, spouse, sibling, or friend could be sold away at any time. In an attempt to communicate the agony of living with such uncertainty, we collaborated with a master storyteller to create a media piece called “Fate in the Balance” for the “Mere Distinction” exhibition. Based on new research by Montpelier’s director of research, Elizabeth Ladner, the story, which is told from the point of view of Ellen Stewart, the daughter of Dolley Madison’s enslaved ladies’ maid, enumerates the losses that Stewart and her family members personally experienced. Elizabeth Chew is the vice president for museum programs at Montpelier.